Wash and drain lentils. Place in saucepan, add water and salt. Bring to boil, reduce heat and simmer, covered about 20 minutes. Do not overcook. The lentils should be tender with skin intact. Drain immediately. 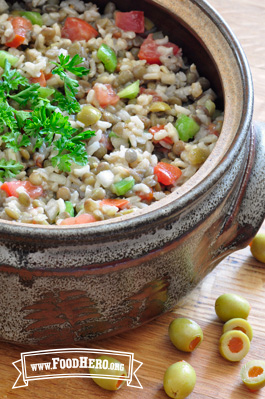 Combine the lentils with cooked rice, pour dressing over mixture and refrigerate until cool. Add rest of ingredients, except parsley, mix well. Garnish with parsley before serving (optional). 1 Comments for "Lentil Confetti Salad"
This is a really good salad! Slightly crunchy which is nice!